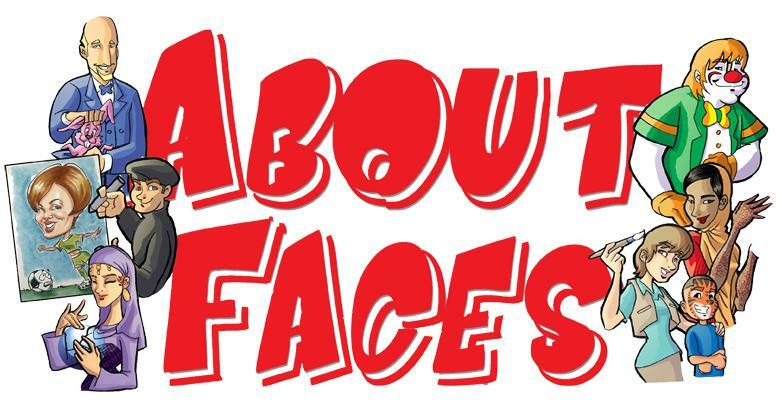 Book About Faces This June! The air is thick with more than just humidity and pollen this summer -- dark blue square hats are everywhere! It's graduation season, and you need to give a proper send off to the little bird leaving the nest. 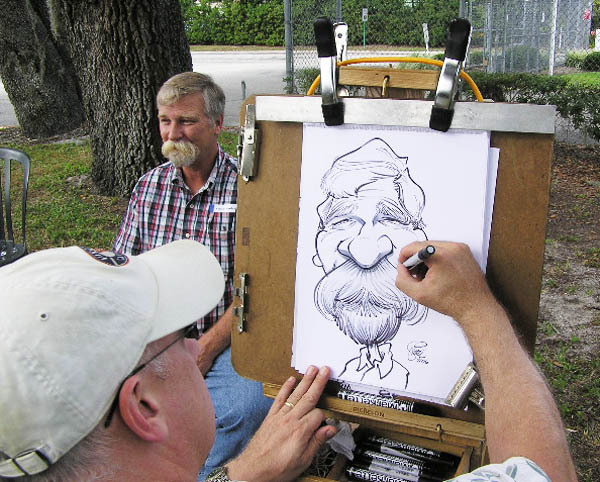 If all the birdies are secure in the nest, there is no reason you can't book several entertainers (caricature artists? Henna tattoo artists? Maybe some face painters?) for your end-of-season office party. And we all know how fast summer speeds by -- don't let the Fourth of July surprise you! Now is the time to book your entertainment, because fireworks will be going off before you know it! Whatever the reason, whatever the question, About Faces Entertainment is the answer. At About Faces, we turn every event into a memory. 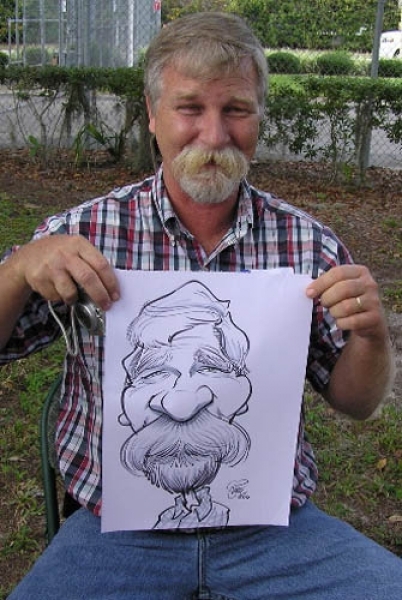 Here, caricature artist Dave S sketches a comical mustache -- but his is only one example of the fine and funny entertainment we provide. Here is the completion of the journey we make. Our service starts with a phone call or email, but it ends with you and your party-goers enjoying a special moment only we can bring. 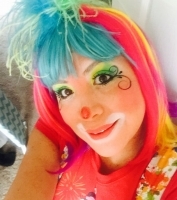 Featured Entertainer: Jessie the Clown! I am a clown and face painter in Florida. 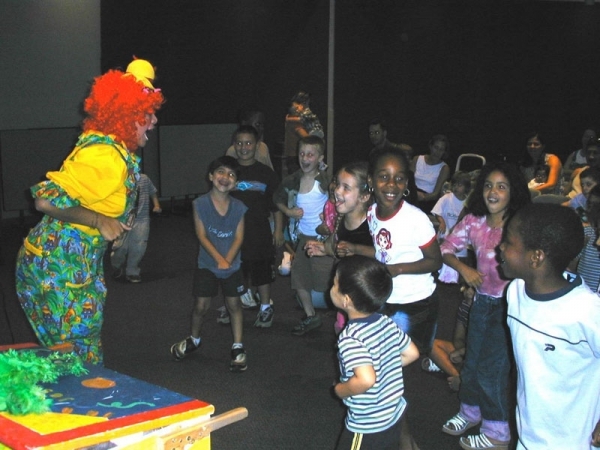 I started this wonderful career of clowning in 2001, but before that I applied to be a children's character entertainer such as Barney, Elmo and so forth. I just loved it! And as an added bonus, those costumes can be very warm, so I ended up losing like 15 lbs. Two months later, I decided that I wanted to be a clown. I organized a party at my house, and I invited all the kids from my neighborhood. Two days before, I had gone to a Party City store and bought myself a clown costume and makeup. I invited one of the owners of a well known entertainment company at that time to come and see me. He liked how I interacted with the children and they started hiring me for their customer's birthday parties, and here I am now. The most memorable event I worked was definitely in Mexico at CASA AMIGA, which is an underground center for victims of physical an emotional abuse. For three years, I volunteered my services as a clown and brought a Santa Claus with me in December. We both performed a musical show for the victims and brought toys as well. Since I also worked for the American Consulate at that time, I was able to ask for toys donations to the employees who work there. Those shows were one of the most fulfilling moments that I ever had in my life. Bringing happiness to those who need it the most is priceless. I'd like everyone to know that I love and respect my clown career, and I love children very much! I always bring my best to provide a great wholesome show for everybody. Regardless of their age, language and culture, my goal is to make people smile. We all have a little child inside of us, and my job is to bring out that child in you when I perform. Entertainers overheat too, so remember that shade tents are welcome at your outdoor events! Why are you still reading? You've got entertainment to book! Call 1-800-92-FUNNY or reply to this email to start booking your entertainment right now!